"The Wicked Wench" in the Bottle. Last month, in between late night parade rehearsals at the park, Jody and I helped out on a pretty nifty project over at the Disneyland Hotel. 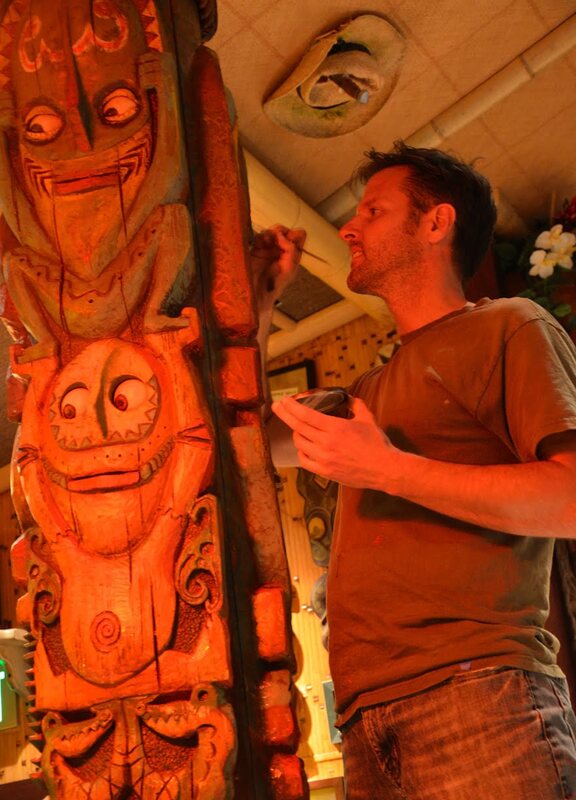 If you're a Tiki fan or Disney nut, you may have heard about Trader Sam's Enchanted Tiki Bar which opened in May. You might even have already visited! 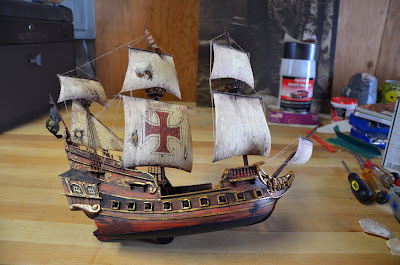 For the new bar, Jody and I scratch-built a one-of-a-kind scale model replica of the "Wicked Wench" - the ship that fires cannon balls over your head in the Pirates of the Caribbean attraction. 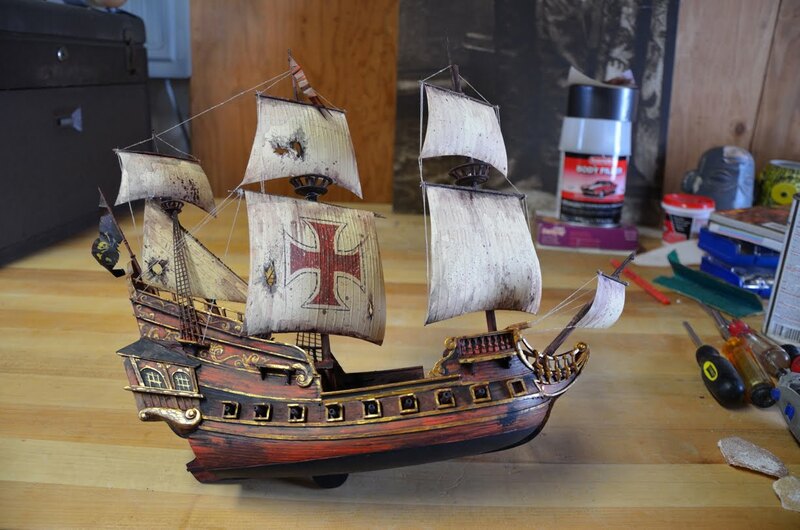 Our miniature version is rigged up to do a little trick. I won't give away the surprise, but if you order a 'Shipwreck cocktail' ( a nice lemony Bourbon thing ), the boat in the bottle, um...well, it does something! 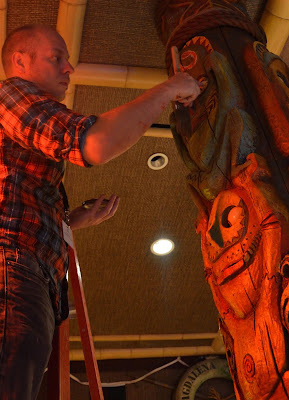 While the Imagineering team worked late into the night programming lighting effects and Krakatoa explosions, Jody and I rolled up our sleeves and painted the totems over the bar. 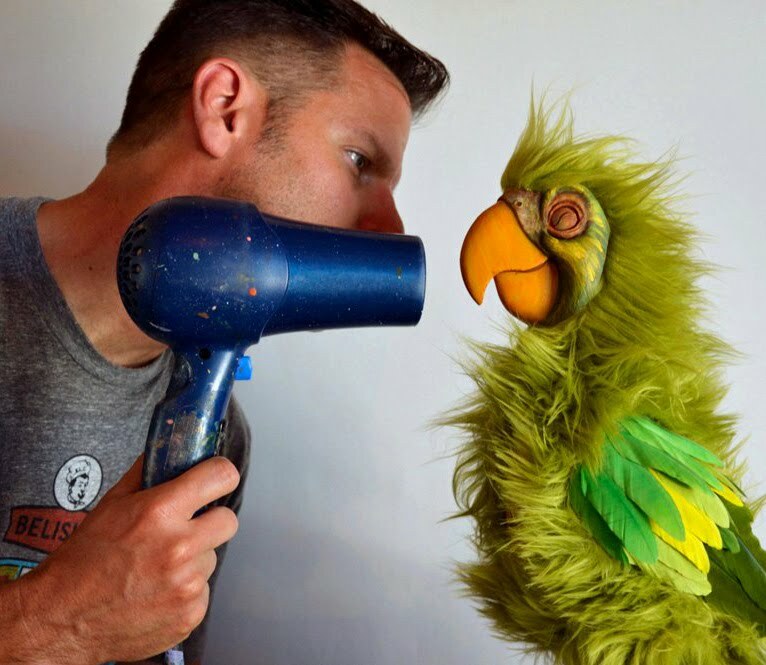 These are, of course, cast from the original molds created for the Enchanted Tiki Room attraction, and we picked colors to match, as near as we could, the original 1963 paint scheme of the show. If you find yourself anywhere near the Disneyland Hotel this summer, I recommend you drop in to Trader Sam's for a refreshing grog and any food item on the menu that is panko-crusted. Sam's is easily the best bar in the resort and has become one of our favorite local hangouts. I love your artistry Kevin, can't wait to see your artworks at the Disney Gallery on main Street this summer ! 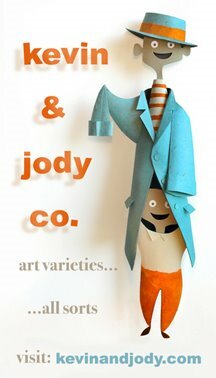 Can't wait to check it out - with you two behind it, I am sure it looks damn fab! 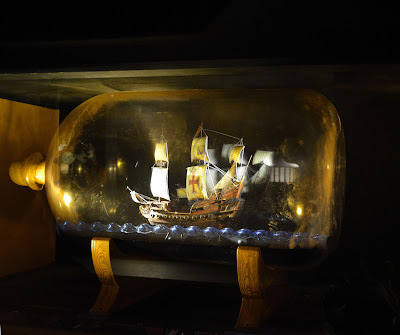 I'm glad to hear they didn't just "take" the ship in a bottle from The Adventurers Club, that way the original will be around when they reopen it! This is all amazing! I can't wait to see it in person, I will definitely have to visit soon. And I'm so looking forward to seeing the parade too, the pictures look fantastic. I thought it likely that you and Jody might have had some involvement with this new place. I'm rather intrigued about it and hope I'll get to visit Disneyland again someday so I can also visit Trader Sam's. While the visuals look great, did they go all the way with the background music as well? I hope they're playing Martin Denny and not Lady Gaga! Well I'm feeling a little thirsty for one of those lemony grog things, just so I can see what the miniature ship does. Thanks for sharing your story, very cool. A group of us recently checked out Trader Sam's and between the five of us ordered every specialty cocktail on the menu! Needless to say, while we were there we saw your ship in action, as well as many of the other gags. It's a great place to kick back with friends after a long day at the parks. Nice work, as always. You guys did great work (as usual). I've already been a couple times and the entire experience is outstanding. I also love seeing pieces from local tiki artists up on the walls and shelves. Bosko and Tiki tOny and Kirby...oh my! I will definitely have to visit as soon as possible, I really enjoyed here too much, And I am also looking forward to seeing the parade too, the pictures look fantastic. Can not WAIT to hit Trader Sam's up next time we go! !